Xiong is one of 495 gardeners working seven acres of land on Country Road C and Hazelwood Road. The land is owned by First Evangelical Free Church, a block away. 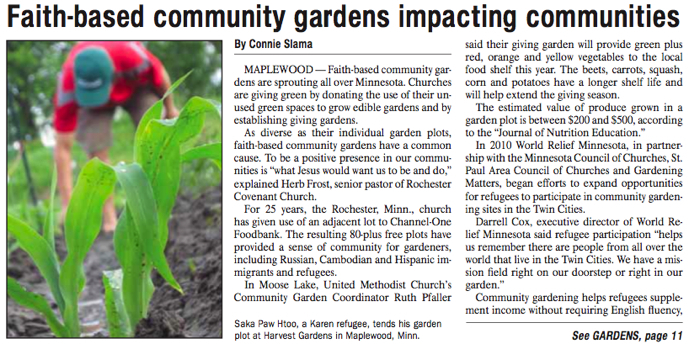 Since the church shares facilities with Hmong Hope Community Church and was connected to the Burmese Karen refugee community through another church, 75 percent of the gardeners are Hmong, and 9 percent are Karen. The space has expanded from one small garden in 2009 to 960 15-by-15 foot plots this year. Volunteers surveyed the land, laid the 4600 feet of irrigation, and staked the plots. Gardeners pay nothing. “We really want to just show the love of Christ through being a good neighbor and through visiting gardeners and offering what we have for people to benefit from,” said Tina Middlemiss, a First Free Church member and Harvest gardener.